Thirty years ago tomorrow, my wife's niece was born. Of course she's my niece too, but as the first grandchild on my wife's side of the family, I thought that I would make the distinction. Happy Birthday Abba! (It's a family nickname that results from her younger sister's inability to pronounce her real name - her parents weren't ageing fans of a Swedish pop group!) A few months after her birth she was baptised at St Mary's Anglican Church at Kangaroo Point. Here are her proud grandparents holding her after the ceremony - note the large porphyry stones in the wall behind them. 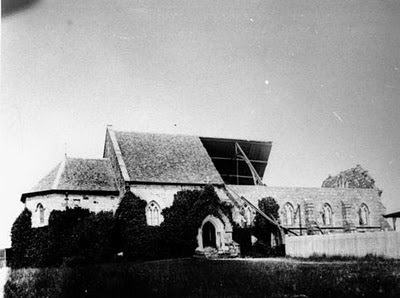 In 1873, the Anglican Church of St Mary the Virgin was built by Alfred Grant at Kangaroo Point to a design by well-known Brisbane ecclesiastical architect RG Suter. It is a Gothic design, constructed from Brisbane porphyry or "tuff", possibly quarried from the Kangaroo Point cliffs immediately behind the church which overlooks the Brisbane River from its hillside position on Main St near River Terrace. Here is a current photo of the entrance to the church, which is situated at the river end of the building, away from Main St. The new Kangaroo Point Parklands that have replaced the old TAFE college abut the southern side of the church. The stone structure replaced an earlier timber church that had been built in 1849. The sturdier material didn't prevent damage from a cyclone that struck Brisbane in 1892 - see the picure below. The former shingle roof has now been replaced by the Queensland favourite, galvanised iron. In 1876, a pipe organ was imported from a church in England, and it remains in the church as the oldest pipe organ in Queensland. Apparently, when Queensland's governors lived at Old Government House, this was the church they frequented. I wonder why they wouldn't have used the closer St John's down the road in George St? And, would they have travelled by road across the Victoria Bridge through South Brisbane and Woolloongabba to the church, or would they have crossed the river by ferry or vice-regal vessel of some sort? Questions, questions! I never tire of looking at magnificent sandstone churches.